Orbital ATK's uncrewed Cygnus cargo spacecraft sits atop a United Launch Alliance Atlas V rocket at Cape Canaveral Air Force Station in Florida on Dec. 3, 2015. The private Cygnus cargo spacecraft will have to wait a bit longer to make its highly anticipated return to orbit. 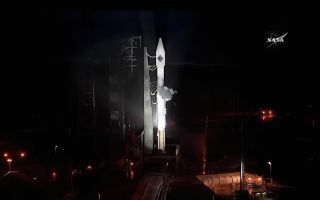 The uncrewed Cygnus freighter, which is built by aerospace company Orbital ATK, was scheduled to launch toward the International Space Station Thursday evening (Dec. 3) at 5:55 p.m. EST (2255 GMT) from Florida's Cape Canaveral Air Force Station, but bad weather scuttled the liftoff attempt. The next opportunity comes Friday (Dec. 4) at 5:33 p.m. EST (2233 GMT), NASA officials said; you can watch that launch attempt live here at Space.com, courtesy of NASA TV. Current weather forecasts predict just a 30 percent chance of good conditions on Friday. Cygnus hasn't flown since October 2014. On that mission — the third of eight cargo flights Orbital is making to the space station under a $1.9 billion NASA deal — the company's Antares rocket exploded just seconds after liftoff, destroying the Cygnus and all its cargo. Virginia-based Orbital is modifying the Antares, replacing its AJ-26 first-stage engines with RD-181 engines, and the revamped version of the booster should be ready to fly sometime next year, company representatives have said. Until that happens, the Cygnus will reach orbit atop a United Launch Alliance Atlas V rocket. The Cygnus that was supposed to launch Thursday, which is named Deke Slayton II after the former NASA astronaut, is packed with about 7,700 lbs. (3,500 kilograms) of food, supplies and scientific gear, including a tiny cubesat built by middle-school students in Virginia (which itself is carrying a golden medallion that was blessed by the Pope). Orbital ATK isn't the only company with a NASA cargo contract. California-based SpaceX has its own deal, worth $1.6 billion, to fly at least 12 uncrewed missions to the space station using its Dragon capsule and Falcon 9 rocket. The first six SpaceX resupply missions went well, but the seventh ended less than three minutes after liftoff when the Falcon 9 broke apart in the Florida skies this past June.